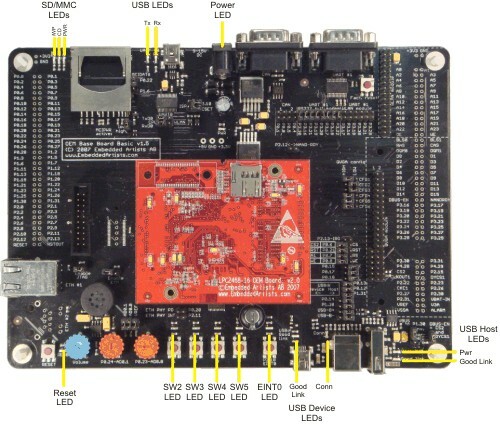 The SD/MMC LEDs indicates the status of the SD/MMC Card adapter. The /WP LED indicates that the inserted card is write-protected. The CD LED indicates that a card is present in the adapter. The PWR LED indicates that power is present for the memory card. The USB Tx LED indicates that serial data is being transmitted from the USB Serial channel. The USB Rx LED indicates that data is being received to the USB Serial channel. The Reset LED indicates the LPC2468 has received an external reset. The SW2-SW5 LEDs display based on the data send over the I2C communcations channel. The EINT0 LED displays when the corresponding EINT0 button is pressed. This sends an external interrupt (P2.10) to the MCU. The USB Device LEDs Good Link indicates a good USB link to a USB Host. The USB Device LEDs Conn indicates that a USB connection to the USB host is present. The USB Host LEDs Pwr indicates that USB power is available for a connecting USB Device. The USB Host LEDs Good Link indicates a good USB link to a USB Device.